SAN FRANCISCO--(BUSINESS WIRE)--Twitch, the world’s leading social video platform and community for gamers, today announced the official TwitchCon 2016 tournament for Streamline, one of the premier Stream First games set for release in 2016. From Monday, September 12 through Friday, September 16, the Streamline Road to TwitchCon Tournament will feature five top Twitch streamers hosting the game on their channels, with the top-finishing player on each broadcast winning a trip to TwitchCon 2016 to play in the tournament grand finale on Saturday, October 1. The grand prize for the final round at TwitchCon 2016 is $10,000. Streamline, by Boston-based developer Proletariat, is a third-person multiplayer action game that pits streamers against their viewers in various bright, urban arenas with ever-changing rules and stage conditions voted on by the spectators. In the game’s flagship Elimination mode, streamers and up to 15 other players engage in a fast-paced match of cat and mouse. In this mode, Runners must score as many points as possible by collecting orbs, stealing them from other players, and earning bonuses for performance-based achievements—all while avoiding being eliminated by the lone Hunter. Throughout each match, viewers have a direct impact on the game. Using a browser-based controller called Streamote, they can ratchet up the pressure by voting for or deploying rule changes, including turning the ground into lava, making the players move slowly, and dozens more. Spectators can also place bets on which Runner will emerge victorious and even play bingo against other viewers based on in-game events. Players can sign up for the tournament at roadtotwitchcon.com. The top finishers in each of the five official Streamline Road to TwitchCon Tournament preliminaries will be announced on Monday, September 19 with the finals held at TwitchCon 2016 on October 1. The contest is open to legal citizens of the United States and Canada (excluding Quebec) with full contest rules here. Learn how to tune into and participate in the qualifying rounds on the Twitch blog. In addition to featuring the Streamline finals at TwitchCon 2016, several other new Stream First titles will be revealed at the convention that illustrate the breadth of the genre. Like Streamline, these games are designed from the ground up for the live streamed experience and enable broadcasters and their audiences to play together in innovative ways. For more information on TwitchCon 2016 (#TwitchCon2016), visit the official site and follow @TwitchCon and @Twitch. Twitch is the world’s leading social video platform and community for gamers. Each month, more than 100 million community members gather to watch and talk about video games with more than 2 million broadcasters. Twitch’s video platform is the backbone of both live and on-demand distribution for the entire video game ecosystem. This includes game developers, publishers, media outlets, events, user generated content, and the entire esports scene. Twitch also features Twitch Creative, a category devoted to artists and the creative process. For more information about Twitch, visit the official website and blog. 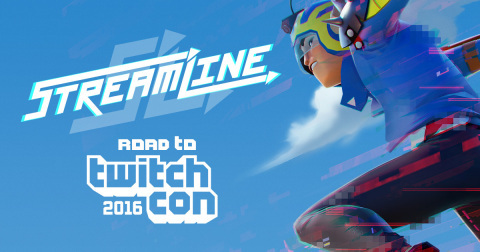 Twitch announces the Streamline Road to TwitchCon Tournament. The tournament features Streamline, a game built for streamers, and begins on 9/12. The finals take place at TwitchCon 2016.